If you're thinking about starting a family, it's only natural to wonder about what companies provide the best maternity leave options. While all U.S. companies with 50 or more employees within a 75 mile radius are required to provide Family Medical Leave Act (FMLA) leave to new parents who meet eligibility requirements, this type of leave is unpaid. Some employers go beyond what the law requires, providing new mothers with paid maternity leave. While the companies featured here were selected specifically because of their maternity leave benefits, it's important to note that all of them are also included on Working Mother magazine's list of the 100 best employers for working mothers. It seems only natural that employers that are generous when allowing time off for new parents have other benefits that meet the needs of parents in the workforce. Please note that the benefits describe here apply to U.S. workers as of December 2013. Employers can change their benefits programs at any time and qualification requirements (such as length of service and full-time status) may apply. Be sure to verify current availability and eligibility requirements if you are considering applying for or accepting a job. Bank of America (BOA) provides employees with 12 weeks of paid parental leave. It is available to new mothers and fathers, and applies to those who adopt a child as well as for the birth of a child. Types of work: BOA hires for a full range of banking positions, from tellers to branch managers, as well as back-office functions such as customer service, human resources and information technology. Application: Use the Guided Job Search feature on the BOA website to search for open positions and complete the application process. Deloitte offers parental leave for primary and non-primary caregivers in circumstances of birth or adoption. Primary caregivers receive eight weeks of paid parental leave while non-primary caregivers receive three weeks of paid time off. Types of work: As a financial consulting firm, Deloitte hires auditors and tax specialists and management and accounting consultants, as well as administrative support professionals. Application: See Careers.Deloitte.com to view and apply for available employment opportunities. Ernst & Young's benefits also include time off for primary and non-primary caregivers for the birth or adoption of a child, as well as for assuming legal guardianship or taking a child in for foster care. Primary caregivers are granted six weeks of paid leave while non-primary caregivers receive two weeks of compensated time off. Types of work: Ernst & Young specializes in accounting, tax and industry-specific advisory services, and so recruits personnel with financial and risk management expertise, as well as support personnel. Application: You can search the company's job database and apply for open positions via the Job Search page at Ey.com. General Mills offers 30 days (6 weeks) of paid maternity leave benefits to new mothers and 10 days (2 weeks) for new fathers for the birth of a child. The company also provides two weeks of paid parenting leave for employees who adopt a child as well as reimbursement for up to $1,000 of adoption-related expenses. Types of work: General Mills has a broad spectrum of jobs, including manufacturing, quality, engineering, research, marketing, sales, operations, HR, administrative support and more. Application: Visit the Careers page on the company's website to identify available jobs and get details on how to apply based on the type of position you are seeking. Texas Instruments (TI) offers eight weeks of paid maternity leave to birth mothers, as well as two weeks of paid leave to new fathers. The company also provides two weeks of paid leave to employees who become adoptive parents, along with up to $4,000 to cover adoption-related expenses. Types of work: TI hires people to work in manufacturing, engineering and operations jobs, as well as technicians, operators and administrative management and support professionals. Application: To learn about and apply for current openings, visit Careers.TI.com. 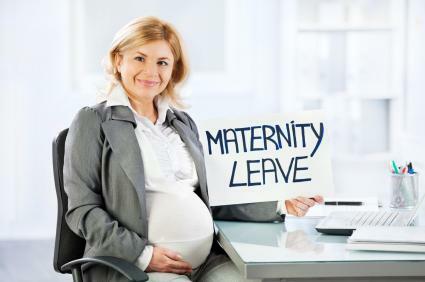 While paid maternity leave is not the norm with U.S. employers, many other companies do offer maternity leave - though they do not all make details about their employee benefits available to the general public. Many of the other companies on the Working Mother list offer maternity leave, so it is a good starting point for researching additional options. If you are trying to find out about companies in your particular area, keep in mind that large organizations with an emphasis on work-life balance are the ones most likely to offer this type of benefit. Review the websites of major employers in your area to see if details of their benefits programs are published, and look to see if they seem to emphasize work-life balance and the concept of being a family-friendly employer; organizations with these values are the ones most likely to offer maternity leave.